This installment of my "Ghost City" column for The Grid was originally published on May 14, 2013. Last week, an onsite time capsule was opened. The Canadian Pacific Railway was tired of arguing. Negotiations with government bodies over the development of a replacement for the existing Union Station were heading nowhere fast. Fatigued by squabbling, in 1912, the CPR moved several passenger routes from downtown to a line it controlled in the north end of the city. While a train station already existed on the west side of Yonge Street near Summerhill Avenue, it hardly matched CPR executives’ visions of grandeur. Fresh off designing the railway’s office tower at King and Yonge, architects Frank Darling and John Pearson were assigned to create a new North Toronto station. The centrepiece of their plan was a 140-foot clock tower inspired by the Campanile in St. Mark’s Square in Venice. The clock would be synchronized via telegraph signals from the CPR’s Windsor Station in Montreal. Also included was a grand waiting room with a three-storey high ceiling and marble facing. 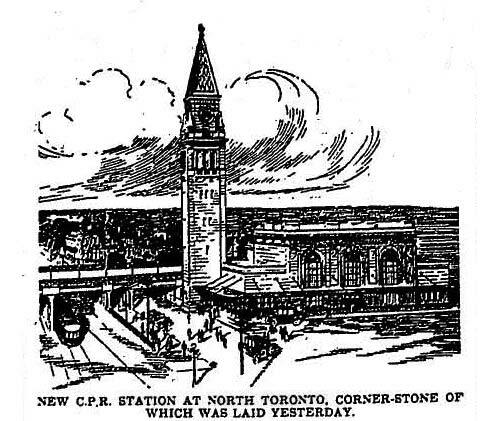 When Mayor Tommy Church laid the cornerstone on September 9, 1915, he praised the CPR for being “the first railway company to give Toronto proper recognition.” He hoped the station would be the first of a series of railway gateways to the city, improving inter-city commuting. 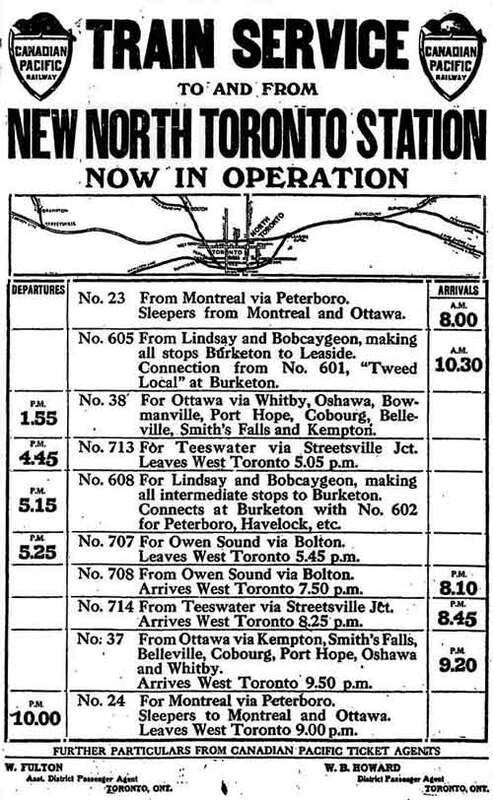 When passenger service began on June 4, 1916, destinations included Lindsay, Owen Sound, and Ottawa. The most popular route was Montreal, which attracted wealthy businessmen who lived nearby. 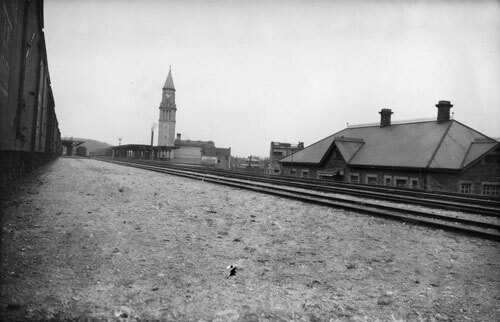 Old and new CPR North Toronto stations, circa 1920. City of Toronto Archives, Fonds 1244, Item 1748. The station’s demise began when the new Union Station finally opened in 1927. Passengers found transfers easier downtown, while the streetcar ride between the two stations grew longer as vehicular traffic increased along Yonge Street. The final four passenger routes were scrapped in September 1930, though freight trains continued to use the facility. The station was pressed into service for the arrival of King George VI’s train during the May 1939 royal visit, and for unloading returning troops at the end of the World War II. In the interim, the building’s long association with alcohol began. Brewers’ Retail opened a store on the north side of the station in 1931, while the LCBO settled into the south side in 1940. Not until late 1978 could liquor-store customers pick their own bottles instead of filling out forms fussed over by judgmental staff. “Often, a clerk would smugly inform you that the cheap sherry you wanted was O/S (out of stock),” Toronto Life recalled in 2003. “Another clerk might confide that the guy who just waited on you had been a teacher but had suffered ‘a nervous breakdown.’ You knew that every one of the staff had been voting Tory since before that Benedictine monk invented champagne.” Adding to the institutional feel was the lowering of the ceilings and covering up of many of the station’s grandiose touches. 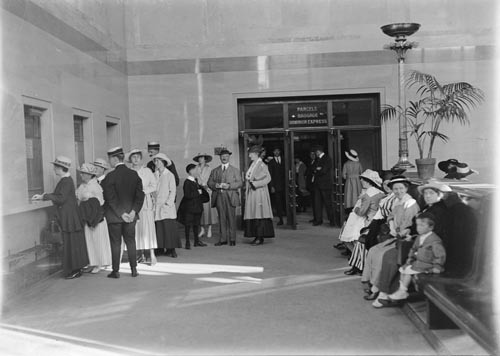 Ticket area, circa 1916. City of Toronto Archives, Fonds 1244, Item 930. While stocking up on your drinking needs, take a moment to observe the station’s railway heritage. Look up to the ornate ceiling covering the domestic and Italian wine selections. See the ticket booths nestled among the Chilean wines. While walking through the western portion of the Vintages section, imagine strolling along a walkway to your train platform. Ponder if the bottles on the shelves of the “Vins de Table” section are fine beverages or deserve to be dumped down the toilets like those which graced this portion of the station. Click here for bonus material prepared when this article was originally published. Additional material from Toronto’s Railway Heritage by Derek Boles (Charleston: Arcadia, 2009), Toronto Observed by William Dendy and William Kilbourn (Toronto: Oxford University Press, 1986), the February 4, 2003 edition of the Canada News Wire, the September 10, 1915 edition of the Globe, the June 2003 edition of Toronto Life, and the June 3, 1916, November 26, 1978, and January 19, 2002 editions of the Toronto Star. JB's Warehouse and Curio Emporium—selling words and images since 2003. Home to the historical odds and ends of Toronto-based writer Jamie Bradburn. Masterpieces of Western Literature Dept.